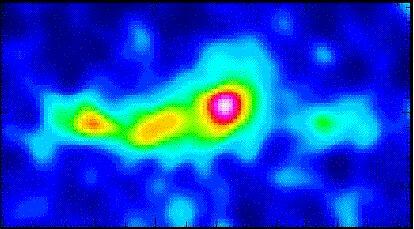 Radio map of galaxies in the core of the Shapley Concentration: A3556-A3558-A3562 chain. Credit: T. Venturi, S. Bardelli, R. Morganti, & R. W. Hunstead, Istituto di Radioastronomia. The Shapley Concentration is the richest supercluster of galaxies in the nearby universe. The Shapley Concentration is made up of 25 separate clusters grouped together in one giant supercluster some 700 million light-years away and with a total mass of about 1016 (10,000 trillion) solar masses. Its gravitational attraction contributes perhaps 25% of the motion of the Local Group. At the core of the Shapley Concentration is a remarkable complex formed by several rich clusters of galaxies from the Abell catalog – A3558, A3562, and A3556 – and by the two minor groups SC 1327-312 and SC 1329-314. The central and most massive cluster is A3558, which is dominated by a cD galaxy.